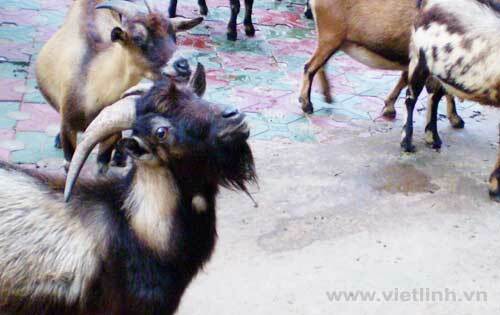 The goat farming industry in Dak Lak Province, Viet Nam started to flourish more than 2 years ago. Recently, some farmers in Bac Lieu Province have implemented intensive and semi-intensive shrimp farming models that focus on efficiency, sustainability, and adaptation to climate change. For example, Lam Van Linh living in Vinh Trach Dong Commune, Bac Lieu City is one of the shrimp farmers applying these models. With 7 hectares of intensive and semi-intensive shrimp farming, Lam raised shrimp in earthen ponds without using chemicals. He keeps a sparse stocking density, about 60 - 80 whiteleg shrimp/square meter, or 12 - 15 black tiger prawn/square meter. In several ponds, he farms tilapia to treat water that is used to supply for shrimp ponds. After harvesting the shrimp, tilapia will be stocked to shrimp ponds to treat pond bottoms. In 2018, Lam harvested more than 80 tons of both black tiger prawn and whiteleg shrimp. After deducting all expenses, he earns a profit of 4.2 billion Vietnamese dong. This year, Lam raises 10 hectares with more than 50 shrimp ponds, including 1 crop of whiteleg shrimp, 1 crop of black tiger prawn, and then 1 crop of whiteleg shrimp. So far, his farming model is developing very well. Vietnam's shrimp export still faces various barriers such as anti-dumping tax, the Seafood Import Monitoring Program of the U.S., and the competition of low shrimp prices from India. At the same time, several export markets have started to strengthen their quality and food safety control. Such markets include the U.S., EU, Arab countries, and South Korean. The Directorate of Fisheries of Vietnam aims to achieve a shrimp export turnover of $4.2 billion in 2019. Accordingly, the current farming area needs to be maintained. Along with that, the total shrimp output must reach 780,000 tons, including 300,000 tons of black tiger prawn and 480,000 tons of whiteleg shrimp. Goat. The picture is for illustrative purpose only. According to authorities of Dak Lak Province, the goat farming industry here started to flourish more than 2 years ago. The province now has about 1,200 households farming goats with a total herd of about 70,000. The annual output of goat meat is about 740 tons. Although goat production increases rapidly, it still ensures an advantageous output. According to farmers, goat is a disease-resistant species; it has good resistance to severe weather and windy climate in this region. Every 4-5 months, a doe will give birth to 2-3 kids. After 5 to 6 month of farming, a goat can be sold for at least 1.5 million Vietnamese dong. With high profit as well as convenient care, many farmers will expand the scale of their farms. There have many programs in Dak Lak Province that support people to develop goat farming and make this career become one of the key occupations for economic development and poverty reduction in the province. In the past few years, the price of key agricultural products of Gia Lai Province has been continuously reduced while the prices of agricultural materials and labor keep increasing. Currently, the price of pepper is fluctuating at 42,000-43,000 Vietnamese dong/kg. The price of coffee is only at 32-33 million Vietnamese dong/ ton. These low prices make it difficult for growers to earn profits. In addition to pepper and coffee, the price of cashew nuts also fell sharply. In previous years, the price of raw cashew nuts reached 45,000-50,000 Vietnamese dong/kilogram. This year, it is only about 30,000-32,000 Vietnamese dong/kilogram. The main crops of the province such as rubber, pepper that were once known as profitable products are now making farmers concerned because of their low prices. Even with investment, farmers still don’t get much profit from these crops and even face losses. At this time, many farmers in the isle communes of Long Ho District, Vinh Long Province are excited because the price of their rambutan is high. According to the Binh Hoa Phuoc Rabutam Cooperative, on recent days, traders come to gardens to buy Java rambutan at 18,000 to 21,000 Vietnamese dong/kilogram. This price is doubled compared to the time before the Lunar New Year. Particularly, the price of Thai rambutan ranges from 45,000 to 50,000 Vietnamese dong/kilogram, and sugar rambutan ranges from 20,000-2,000 Vietnamese dong/kilogram. The reason of rambutan’s high price is due to low productivity of several rambutan orchards. The supply did not meet demand; thus, the price of this fruit is increasing. The list of key agricultural products of Vinh Long Province includes 3 species of trees and 3 species of animals. For cultivation products, the list includes rice, sweet potatoes, and citrus trees (such as Nam Roi pomelo, green-skin pomelo and orange). For livestock products, there are pigs, cows, and seafood (such as swai – Tra fish, and tilapia). This list is a basis for the province to organize its agricultural production into chains, apply high technology into farming, and bring its products to the national list of key goods. The list helps the province develop its agriculture in accordance with local socio-economic conditions and meet the demand for future development. In the early months of 2019, the El Nino phenomenon tends to return according to its cycle. This phenomenon causes severe drought and saline intrusion. The National Center for Hydro-Meteorological Forecasting of Vietnam predicts that in March 2016, salinity will penetrate deeply into the Mekong Delta. In May, if there is no rain, salinity on the estuaries of rivers will remain as high as in April. This situation is likely to last until June. Without timely response, the Mekong Delta may suffer from not only suffers from challenging weather, but also heavy losses from salinity.